Introduction | Steven J. Barela, LL.M., Ph.D.
Before aviators risked climbing aboard vehicles to direct their airborne flight from inside a cockpit, unmanned flying objects were our first encounter with the skies. From Chinese kites to the first hot air balloon, the human experience with flight started with the pilot’s feet planted firmly on the ground. Thus it is appropriate to begin this work with recognition that unmanned aerial systems (UAS) are not new, but in fact the precursor to the aircraft that we know today: those that have come to dominate our understanding flight itself. Hence, a part of the paradigm shift we are experiencing at the beginning of the twenty-first century can be considered as a reacquaintance with our past, built upon all that we have learned about effective flight control from the onboard experience, rather than as an unprecedented march into the future. This volume will address one specific military application of the new technology: unmanned combat aerial vehicles (UCAVs, commonly referred to as drones) used for counterterrorism operations carried out across international borders. The fact that these aerial vehicles are armed with precision guided missiles and infrared cameras producing full motion video is a significant change; this enables the crew to target an individual from thousands of miles away. As a result there has been a reduction of practical constraints on exercising lethal force across borders and across the globe in a time when violent individuals and groups are seen by many as the most substantial threat posed to a nation. While drones have been rightly identified as just another weapons platform, they have also directly altered the calculations for exercising force within the territory of other states. Throughout this work we will see that it is this significantly increased facility for exercising deadly force in far-flung regions across the globe that is putting great stress on many of our established norms. 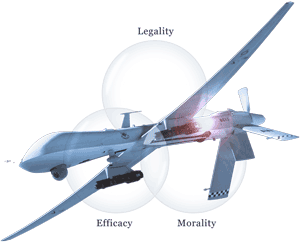 Our existing legal and moral frameworks, not to mention methods for judging efficacy, are often insufficient, or not quite applicable, to the novel use of killer drones. Consequently, our book aims to explore this tension and consider a policy proposal meant to ease this strain. Throughout this work we will see that it is this significantly increased facility for exercising deadly force in far-flung regions across the globe that is putting great stress on many of our established norms. It is also worth noting that as this technology advances there are countless new applications of the unarmed version: for example, the United Nations builds up its unmanned aircraft capacities for peacekeeping surveillance; UAS are deployed to fight illegal fishing off the coast of Belize and California; flying surveillance vehicles now patrol nearly half of the US-Mexico border; there are inexpensive autonomous 3D robotic quadcopters that follow and film their owners engaging in action sports; and private users fly unmanned aircraft into the middle of firework displays, illegally and dangerously, to capture breathtaking footage. Whether one looks at armed or unarmed UAS, one overarching difficulty can be found in the rapid growth. As is always the case with new technologies, their uses are developing faster than rules, regulation, and enforcement can be instituted. Both politics and general understanding of the shifting considerations impede adequate management of the technology. Nevertheless, parameters for better understanding do indeed exist and in the epigraph to this Introduction we find an idea that has guided the studies in this book. The President of the United States, the very same official who drastically expanded the government’s use of UCAVs for cross-border counterterrorism, exhibits in a 2014 speech that he recognizes that such operations must be broadly believed to be legitimate, and that this legitimacy is subject to erosion. Considering Max Weber’s widely accepted definition of the modern state—“a human community that (successfully) claims the monopoly of the legitimate use of physical force within a given territory”—one can quickly grasp that lethal force repeatedly exercised in the territory of another state raises many questions of legitimacy, both at home and abroad. As is always the case with new technologies, their uses are developing faster than rules, regulation, and enforcement can be instituted. [i]f there is one central message from Lakshman’s speeches and actions, it is that the problem of terrorism has to be tackled within a legal framework; and the struggle between terrorists and their adversaries is to a significant extent a struggle for legitimacy. While more on the relevance of the legal framework of international law will follow, here it is sufficient to underscore the fact that Kadirgamar recognized legitimacy as a principal element in such a conflict. [A]n insurgency is an organized, protracted politico-military struggle designed to weaken the control and legitimacy of an established government, occupying power, or other political authority while increasing insurgent control. In fact, even a cursory reading of the Field Manual reveals a consistent return to the legitimacy theme: “[p]olitical power is the central issue in insurgencies and counterinsurgencies; each side aims to get the people to accept its governance or authority as legitimate”; “the long-term objective for all sides remains acceptance of the legitimacy of one side’s claim to political power by the people of the state or region”; “[v]ictory is achieved when the populace consents to the government’s legitimacy and stops actively and passively supporting the insurgency”; and in the unmistakable sub-title “Legitimacy Is the Main Objective”. What we are seeing is that practitioners and scholars alike are increasingly acknowledging this concept as pivotal. 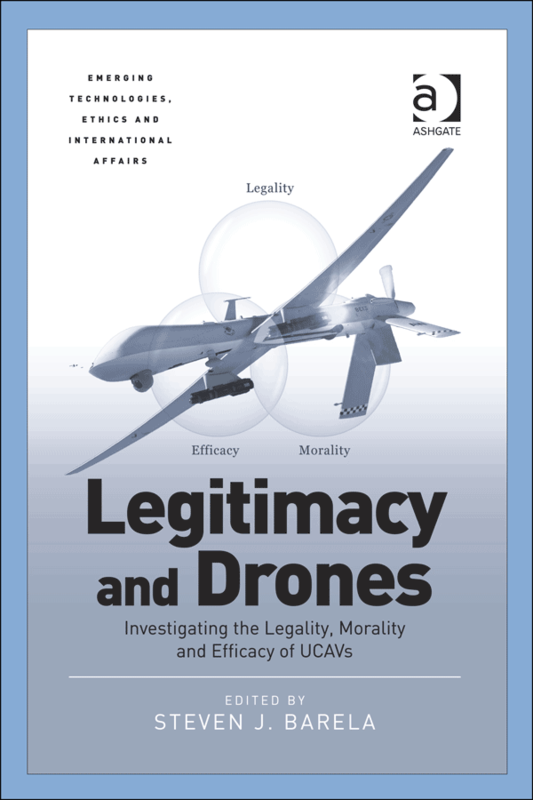 To explore the pertinent queries regarding the legitimacy of drones the accomplished scholars of this volume analyze the principal points at issue by peering through the conceptual lenses of legality, morality, and efficacy. However, what parameters actually construct legitimacy is by no means an easy or settled question. What actually creates an uncoerced pull toward compliance with an authority or a policy? Indeed, this query is one that has confounded and inspired political and legal philosophers for centuries. Machiavelli, Grotius, Hobbes, Rousseau, and Montesquieu are some of the most well-known, to name but a few. Yet this book does not set out to settle such a complex and essential matter. Rather, in the simplest sense, the chapters of this volume have been organized around some of the most accepted and straightforward principles of what constitute legitimacy. To be precise, to explore the pertinent queries regarding the legitimacy of drones the accomplished scholars of this volume analyze the principal points at issue by peering through the conceptual lenses of legality, morality, and efficacy. Put simply, this book begins with the uncomplicated premise that, at a minimum, sound policy should be legal, moral, and effective. To begin with, our actions are effective. 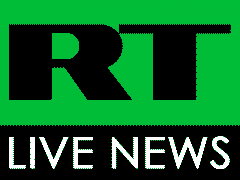 … Dozens of highly skilled al Qaeda commanders, trainers, bomb makers, and operatives have been taken off the battlefield. Plots have been disrupted that would have targeted international aviation, U.S. transit systems, European cities and our troops in Afghanistan. Simply put, these strikes have saved lives. Moreover, America’s actions are legal. We were attacked on 9/11. Within a week, Congress overwhelmingly authorized the use of force. Under domestic law, and international law, the United States is at war with al Qaeda, the Taliban, and their associated forces. So this is a just war—a war waged proportionally, in last resort, and in self-defense. … America’s legitimate claim of self-defense cannot be the end of the discussion. To say a military tactic is legal, or even effective, is not to say it is wise or moral in every instance. To this editor and author, these formulations and arguments do not come as a surprise. My previous work at the University of Geneva was an investigation into how legitimacy can be conceptualized as a target in asymmetrical armed conflict, and posited a theory on the components of such legitimacy. Thus I have my own motivations for organizing the volume in this manner, but the chapter authors have not been asked to explicitly endorse this theory. Nonetheless, even if it is beyond the scope to offer here a full elaboration of this theory, which can be found elsewhere, this Introduction is extended to provide an overview to our readers so that they can judge for themselves the validity of this theory as an organizational device, and the tools of analysis it offers. Accepting the thesis of legitimacy as a target has analytical consequences. By identifying a target at which terrorists aim, this most importantly provides policy-makers and analysts with the opportunity to think defensively. Since the deliberate targeting of civilians is generally accepted as the defining characteristic of terrorism, defending every civilian or civilian object would be extremely difficult, if not impossible. Nonetheless, if we understand that a response needs to be deemed legitimate to best defend this point of attack, it is possible to integrate strategic defensive thinking into the equation of counterterrorism. One keen terrorism scholar has pointed out that while “[s]peed and force are both critical elements in a successful military campaign; it is far less clear that they are necessary ingredients of a successful counterterrorism policy.” The reason why this is so critical is because many who confront terrorism begin with the belief that the primary objective is to kill, interrogate, and detain (often without trial) potential enemies rapidly and with overwhelming force. To wit, this overly offensive approach aims to eliminate or remove all potential enemy combatants without delay or substantial caution. Such an approach confuses tactics with strategy. Overemphasizing this aggressive and tactical aspect of the conflict can lead to an undermining of the defensive strategy of protecting the target of legitimacy—safeguarding that these methods are only employed legally, morally and effectively. By identifying a target at which terrorists aim, this most importantly provides policy-makers and analysts with the opportunity to think defensively. There is little doubt that there will be times when the aggressive methods are necessary, just as in any ordered society. However, losing sight of defending the legitimacy of the government in such a struggle can come at great cost to the society as a whole, and plays into the hands of the purveyors of terror. Most notably, this offensive/defensive framing underscores the fact that defending legitimacy represents an essential strategic interest. If legitimacy can indeed be examined, this again raises the question of determining the components of legitimacy so that we can analyze a counterterrorism response—in this case, the use of UCAVs across borders. To do so, the model of legitimacy as a target has been constructed using an interdisciplinary approach meant to integrate the most valuable features of differing viewpoints and methods. What this means specifically is that the three proposed realms of inquiry have a shared space of overlap to capture the integrative nature of the pull toward compliance; no form of validity is presented to dominate the model at the expense of the others. Additionally, the model allows us to conceptualize and visualize how these individually valuable components relate to each other. There is no doubt that determining legality, morality, and efficacy are valid analytical pursuits in and of themselves. Yet this model explains them as interrelated, rather than independent of one another. Consequently, in employing the Habermasian view that the content of legitimacy can be rationally tested, I propose that there is a useful and proper way to conceptualize legitimacy in a manner that affords the application of a series of overlapping lenses (i.e. tools of analysis) for viewing and discussing these central issues. Accordingly, this book has three sections: formal validity (legality), axiological validity (morality), and empirical validity (efficacy). The logic and reasoning for using legality, morality, and efficacy as the tools of analysis for assessing legitimacy will be expanded as the chapters are presented on the other pages of this site. This book is a collection of investigations from different disciplinary perspectives, and at times those disciplines are interwoven and overlapping. Therefore, it is useful to make a more declarative statement as to how one might categorize this work within disciplinary lines. It is first necessary to elucidate the terms used to describe a research project that is meant to bring together and integrate various disciplines to resolve a question that is too complex to solve through just one field of study. For our purposes, it is the distinction between multidisciplinarity and interdisciplinarity that matters most. While a multidisciplinary work looks at a topic from the perspective of several disciplines at one time and makes a modest attempt to join together their insights, an interdisciplinary project brings together a collection of viewpoints from various disciplines and draws on the diverse insights by finding ways to integrate them. Using these definitions, this book can best be described as a multidisciplinary work that at times crosses over into interdisciplinarity. This structure and design has been employed to help achieve two goals. The first is to consciously separate the work into clear disciplinary categories to shed light on the various questions at stake from important and valid perspectives. The second, made possible with the sharp distinctions in place, is to afford dialogue between the disciplines, as the chapter authors chose, in order to explore the space in which these spheres interact. To the extent that this has been accomplished to successfully illuminate worthwhile points of interplay, the contributing authors deserve credit. However, the complexity of the task undertaken also requires that responsibility falls to the editor for any failings resulting from this design. It is hoped that through exploring the three varied pillars that would erect the legitimacy of drones the reader departs with an expanded purview on this developing military technology, the current usage of which is agitating our existing norms. This is not to say that a final judgment is to be rendered here on the legitimacy of armed drones for cross-border counterterrorism; rather the intent has been to set out some of the central parameters for such an assessment precisely because their legitimate use is so critical. Beyond that, there has also been an effort to deal with some of these disturbances with a meaningful and practical proposal aimed at calming turbulent waters—that is, the establishment of a Drone Court that might reconcile the substantive international law at stake. A veritable discussion has begun about this idea, and this publication aims to push it further. As the intention behind this project was to stimulate conversation about how a government under the threat of terrorism can best defend itself strategically—not just tactically—it is believed that these valuable and diverse contributions can serve to do just that. After all, discussing the legitimacy of drones for cross-border counterterrorism is significant because it is central to the outcome of the conflict itself. Charles Jarnot, “History” in Richard K Barnhart and Stephen B Hottman, et al (eds), Introduction to Unmanned Aerial Systems (CRC Press 2012) at 1-2. This author and editor would like to extend special thanks to Stephen Hottman, director of the Physical Science Laboratory at New Mexico State University, for sitting down and discussing the development, obstacles, and future of UAS, along with offering a tour of their UAV hangar outside of Las Cruces with an experienced pilot. This institute shares airspace with Holloman Air Force Base where military personnel are trained to fly UCAVs. See eg Philip Alston, Study on Targeted Killings, Addendum to Report of the UN Special Rapporteur on Extrajudicial, Summary or Arbitrary Executions (UN Doc A/HRC/14/24/Add.6, May 28, 2010): “a missile fired from a drone is no different from any other commonly used weapon, including a gun fired by a soldier or a helicopter or gunship that fires missiles” at para 79. Samuel Oakford, “Drones, Drones, Everywhere: UN ramping up peacekeeper surveillance flights” Aljazzera America (Aug 27, 2014) available at <http://america.aljazeera.com/articles/2014/8/27/united-nations-drones.html> accessed Nov 2014. Brian Clark Howard, “Can Drones Fight Illegal ‘Pirate’ Fishing? : Conservationists test unmanned aerial vehicles in Belize and California” National Geographic (July 18, 2014) available at <http://news.nationalgeographic.com/news/2014/07/140718-drones-illegal-fishing-pirate-belize-ocean/> accessed Nov 2014. Associated Press in Sierra Vista, Arizona, “Half of US-Mexico Border Now Patrolled Only by Drone” The Guardian (Nov 13, 2014) available at <http://www.theguardian.com/world/2014/nov/13/half-us-mexico-border-patrolled-drone> accessed Nov 2014. Adam Clark Estes, “New Autonomous 3D Robotics Drone Follows You Wherever You Go” Gizmodo (Sept 8, 2014) available at <http://gizmodo.com/new-autonomous-3d-robotics-drone-follows-you-wherever-y-1631694870> accessed Nov 2014. Gregory S McNeal, “Flying A Drone Through Fireworks May Land You In Prison” Forbes (July 4, 2014) available at <http://www.forbes.com/sites/gregorymcneal/2014/07/04/video-shows-drone-flying-through-fireworks/> accessed Nov 2014. Dee Ann Divis, “RTCA Standards Committee Grapples with UAS Collision Avoidance Rules” Inside Global Satellite Navigation Systems (Aug 29, 2014) available at <http://www.insidegnss.com/node/4166> accessed Nov 2014; Conor Dougherty, “Drone Developers Consider Obstacles That Cannot Be Flown Around” New York Times (Sept 1, 2014) available at <http://www.nytimes.com/2014/09/01/technology/as-drone-technology-advances-practical-obstacles-remain.html?_r=3> accessed Nov 2014; Michael Cooney, “Report: Significant technical trials remain before drones can safely access national airspace” Network World (Dec 10, 2014) available at <http://www.networkworld.com/article/2858098/security0/report-significant-technical-trials-remain-before-drones-can-safely-access-national-airspace.html> accessed Dec 2014; and CBS News, “Pilots Report Increasing Close Calls with Drones” (Nov 27, 2014) available at <http://www.cbsnews.com/news/federal-aviation-administration-surge-in-reports-of-drones-interfering-with-aircraft/> accessed Nov 2014. Max Weber, “Politics as a Vocation” in H H Gerth, and C Wright Mills, (eds and trans) From Max Weber: Essays on Sociology (OUP 1946) at 78 (original emphasis). Sir Adam Roberts, Democracy, Sovereignty and Terror: Lakshman Kadirgamar on the Foundations of International Order (IB Tauris 2012) at 25 (my emphasis). Kadirgamar believed that this legal framework particularly included international law: “Lakshman, when foreign minister, always insisted that the relevant rules of the laws of war and human rights must be observed for reasons that were both moral and practical”, ibid at 33; see specifically Kadirgamar’s speech “Human Rights and Armed Conflict”, Kotelawala Defence Academy (March 19, 1996) at 109-118. See Paula Broadwell, All In: The Education of General David Petraeus (The Penguin Press 2012) 301pp. 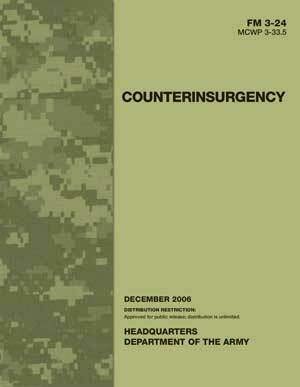 Army Field Manual (FM 3-24), Counterinsurgency, US Department of Defense (December 15, 2006) at 1-1 (my emphasis). Ibid at 1-2 (my emphasis). Ibid at 1-3 (my emphasis). While these citations suggest that both sides aim to be considered legitimate, it is arguable that terrorist groups are primarily focused on destroying the legitimacy of a government and have not pivoted to building their own legitimacy claim, see Steven J Barela, International Law, New Diplomacy and Counterterrorism: An Interdisciplinary Study of Legitimacy (Routledge 2014) at 56-59. Ibid at 1-21 (my emphasis). See eg Deborah Cook, “Legitimacy and Political Violence: A Habermasian Perspective”, (2003) 30,3 Social Justice 108; Audrey Kurth Cronin, How Terrorism Ends: Understanding the Decline and Demise of Terrorist Campaigns (Princeton University Press 2009); Martha Crenshaw (ed) Terrorism, Legitimacy, and Power: The Consequences of Political Violence (Wesleyan University Press 1983); and Michael Ignatieff, The Lesser Evil: Political Ethics in an Age of Terror (Princeton University Press 2004); for an excellent work on how international law fits into this question see Jutta Brunnée and Stephen Toope, Legitimacy and Legality in International Law: an Interactional Account (Cambridge University Press 2010); for additional works that speak to the issue of legitimacy as a part of armed conflicts involving terrorist acts, even if the issue is not explicit and placed as predominant, see Tom Farer, Confronting Global Terrorism and American Neo-Conservatism: The Framework of a Liberal Grand Strategy (OUP 2008); Louise Richardson, What Terrorists Want (Random House 2006); Brian Jenkins, “International Terrorism: A New Mode of Conflict”, in Carlton D and Schaerf C (eds), International Terrorism and World Security (Croom Helm 1975); Walter Laqueur, Terrorism, (Weidenfeld and Nicolson 1977); Maurice Tugwell, “Terrorism and Propaganda: Problem and Response” and Ronald Crelinsten, “Power and Meaning: Terrorism as a Struggle Over Access to the Communication Structure” in P Wilkinson and A Stewart (eds) Contemporary Research on Terrorism (Aberdeen University Press 1987) at 409-418 and 419-450 respectively; see generally Philip Bobbitt, Terror and Consent (Alfred A Knopf 2008); David Cole and Jules Lobel, Less Safe, Less Free (The New Press 2007); Robert Pape, Dying to Win (Random House 2005); Colonel Thomas X Hammes, The Sling and the Stone: on War in the 21st Century (Zenith Press 2006). This apt description of legitimacy has been developed from the work of Thomas Franck, The Power of Legitimacy among Nations (OUP 1990) at 10-34. There are indeed other scholars who have put forward such an organization for the analysis of this tactic. For example see Amos Guiora, Legitimate Target: A Criteria-Based Approach to Targeted Killing (OUP 2013) at xi: “[t]he state’s decision to kill a human being, in the context of operational counterterrorism, must be predicated on an objective determination that the ‘target’ is, indeed, a legitimate target. Otherwise, state action is illegal, immoral, and ultimately ineffective”; see also Gabriella Blum and Phillip Heymann “Law and Policy of Targeted Killing” (2010) 1 Harvard Law School National Security Journal at 149: “[w]e do so by assessing the American and Israeli experience in employing targeted killings and its legal, moral, and strategic implications”. President Barack Obama, “The Future of our Fight against Terrorism”, National Defense University (May 23, 2013) available at <http://www.whitehouse.gov/the-press-office/2013/05/23/remarks-president-barack-obama> accessed Sept 2014. Ibid (my emphasis). Due to the fact that moral judgment today can take a broad host of forms, the president also intended to shore up validity by asserting “over the last four years, my Administration has worked vigorously to establish a framework that governs our use of force against terrorists—insisting upon clear guidelines, oversight and accountability that is now codified in Presidential Policy Guidance that I signed yesterday”. Although President Obama forwarded this as a form of moral argument, there are two better explanations: 1) these parameters are a legal, or institutional, argumentation; 2) it is rather at a point of overlap between legality and morality. Nonetheless, it is not within the scope here to further pursue such an analysis. For an excellent work that also organizes the analysis of killing individual suspected terrorists in this manner, see A. Plaw, Targeting Terrorists: A License to Kill? (Ashgate 2008). 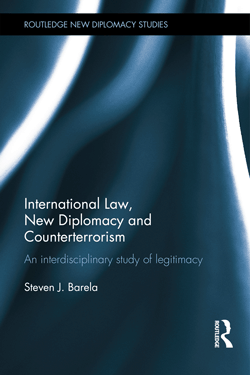 Steven J Barela, International Law, New Diplomacy and Counterterrorism: An Interdisciplinary Study of Legitimacy (Routledge 2014). See eg Richardson (n 19) at 6. Although who exactly should be included in the term “civilian” is contentious as the United States, for example, views the killing of police and soldiers of a government it deems democratic, or at least friendly, as a terrorist act: see Farer (n 19) at 15-29. Richardson (n 19) at 101. It worthwhile to note that these aggressive tactics deal directly with the most basic “personal security rights” that are found as fundamental in both the laws of war and human rights law; they have been enumerated as a “protection from summary execution, torture and other cruel and inhuman and degrading treatment, and conviction and/or punishment without due process of law” by Farer (n 19) at 14. There is an important clarification that should be mentioned concerning the analysis of legitimacy during times of political struggle. Although Max Weber’s work on legitimacy has achieved a classical status in the literature, it has also been described as incomplete. Most importantly, Weber offers a view of legitimacy that is not amenable to proof and cannot be tested because he sees it as based on unspecific subjective beliefs without identifiable content. In contrast to Weber, other scholars adopt the position that the legitimacy of a regime can be accepted or rejected on rational grounds, which actually rests on verifiable content (see eg Beetham (n 29) at 13: “the evidence is available in the public sphere, not in the private recesses of people’s minds”). Most significantly, Jürgen Habermas keenly zeroed in on this shortcoming and suggested, “legitimacy is assumed to have an immanent relation to truth, the grounds on which it is explicitly based contain a rational validity claim that can be tested and criticized independently of the psychological effect of these grounds” (Legitimation Crisis, T McCarthy (trans)(Beacon Press 1975 [German text 1973]) at 97). Considering this significant distinction, it is important to spell out that the theory of legitimacy as a target necessarily rejects the Weberian view of a belief-based legitimacy, and rather embraces the Habermasian notion that it is truth-dependent and testable. The starting point for this model is the sound interdisciplinary work on legal validity by François Ost and Michel van de Kerchove, De la Pyramide au Réseau ? Pour une Théorie Dialectique du Droit. (Publications des Facultés Universitaires Saint-Louis 2002) at 307-383. 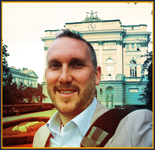 Allen Repko, Interdisciplinary Research: Process and Theory (Sage Publications 2012) at 20-21.